It has been nearly two weeks since that fateful day at Bolton; that I would have attended had I not had a long standing arrangement to go to an old school reunion in Wales. I went to Central Grammar School in Tile Cross (called the International School nowadays) and the school had a cottage in Wales just outside Llanidloes where we used to go for camp in the summer and for geography field trips. I had always resolved to go to the annual get together but had never got round to it and realising that the last time I was there was the summer of 1972 I was determined to attend this year. Needless to say the cottage is in the middle of nowhere in beautiful but remote countryside near the Clywedog reservoir from which Birmingham gets much of its fresh water. There is no mobile phone signal and so the promised updates from Will never materialised at least not until I had cleared the Brecon Beacons on the way back much later in the day. The match was featured on the radio and I went to the car and switched on with about 20 minutes left. We were battering Bolton by all accounts but losing 1-0; (where had I heard that before?) but then the coverage switched to the King Power Stadium as Leicester were awarded a penalty against Doncaster which Nugent duly dispatched. We only needed one goal and there am I imploring the radio with fingers crossed ‘come on Blues just bloody score for heaven’s sake!’ Just at that moment Bolton double their lead! Now with only fourteen minutes to go, I sadly and resignedly switched off the radio and rejoined my mates. We walked down to the Clywedog Dam and back to the Cottage for tea and homemade cake and reminisced about old times. Just before I left one of my old teachers, most of whom are now in their eighties came up to me and said, “Hey Baz, have you heard about the Blues?” I replied, “Yes, when I last checked they were 2-0 down and heading down to the third division; it’s been a shocking season, I’ve been there for most of it!” I went on to lament about trips to Swindon and Sheffield at which point my old teacher said, “No Baz, you’ve got it all wrong; Paul Caddis equalised in the 93rd minute!” “How did Doncaster get on?” I asked. “They lost!” was the reply. “You mean we stopped up?” I exclaimed barely able to believe it. “Yes, indeed!” said my old mentor with a grin. On the way back I eventually had enough signal to ring Will who complained that I failed to answer my phone and failed to acknowledge his texts but despite my explanation he still suggested I was an uncommunicative ******. Will did advise me to watch the events unfolding later, on catch up, and even though I knew what was going to happen it was still exciting. It was a fantastic day for the lucky fans that were able to witness it first hand and their euphoria was something I could fully identify with. Paul Caddis’ goal was electrifying and even had Alan McAnally and Jeff Stelling off their seats in the SKY studio which in itself is worth a watch for those that haven’t seen it on Youtube. The celebrations were like we had won the league or a cup final but of course we hadn’t; all we had done was avoided relegation to the 3rd Division of the football pyramid and ignominiously at that! Let’s be frank about this, this season has been nothing short of awful both on and off the pitch and nearly ended catastrophically, mere goal difference keeping our beloved team from plummeting into the abyss from where Birmingham City would not have been emerging any time soon. Unlike our gold and black neighbours in yam yam land I doubt that we would have had the wherewithal to recover so quickly given everything that has happened to the club in recent times. I thought I would look back over the last three seasons and make some observations as well as making some remarks about this season. A long drawn out saga that has straddled the past three seasons finally culminated in Mr Yeung’s conviction for money laundering and he has been sent down for six years. I have not written anything specific about CY over this period because frankly I didn’t know any concrete facts and to be honest still don’t and therefore, despite his conviction I am still not going to condemn the man out of hand when it comes to the club. At this point I would like to add my thanks to Daniel Ivery over at Often Partisan who has tirelessly tried to keep us all abreast of developments over the months, writing countless articles on the subject. He has had a unique insight into the unfolding story particularly with regard to his first hand observation of the trial in Hong Kong. He has worked hard to provide a reasoned, non-hysterical, unemotional take on proceedings, carefully explaining the vagaries of Hong Kong law and the Hong Kong stock exchange with the acknowledged aid of expert contacts at his disposal. However, a major point that has been repeatedly missed by many is that a lot of Dan’s views are his interpretation of facts as he sees them and he is always at pains to point out that he is neither a financier or a lawyer and that the views expressed in his articles are speculative and must be considered in that context. Unfortunately, the frequency of comment in their attempts to keep us informed given that there has been deafening silence from the club and our Chinese owners has generated an avalanche of hot air and hyperbole which resulted more recently in Dan having to turn his comments section on OP off for a while as some people insisted on posting potentially libellous remarks despite Dan’s entreaties to them not to do so. Dan eloquently explained the reasons for doing this following a meeting with senior club officials and their legal team and I have no doubt everyone reading this piece will have read it. The down side of Dan’s efforts has been to produce highly charged, hysterical comments from some which to my mind have contributed to the negativity on the terraces at St Andrews this season. Imagined Machiavellian plots to completely asset strip the club, sell the ground for redevelopment and then toss away the empty carcass once all the bones have been picked clean simply have no basis in logic, fact or I suspect truth. It has led to low morale, small crowds, lack of atmosphere and apathy at a time when the players needed us most. I can fully understand and respect the views of the fans that chose to stay away but it surely contributed to our appalling home form which I will turn to next. Overall, I’ve looked at the last three seasons since relegation from the Premiership when CY got into trouble with the HK authorities, the money dried up, we started to sell all the family silver and it can be seen that this has reflected on the fortunes of the club year on year. 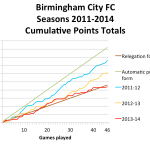 I’ve produced cumulative worm graphs showing Blues’ performances in the league and have added two lines; one which represents two points a game and would lead to automatic promotion and the other which is one point per game and generally represents relegation form. 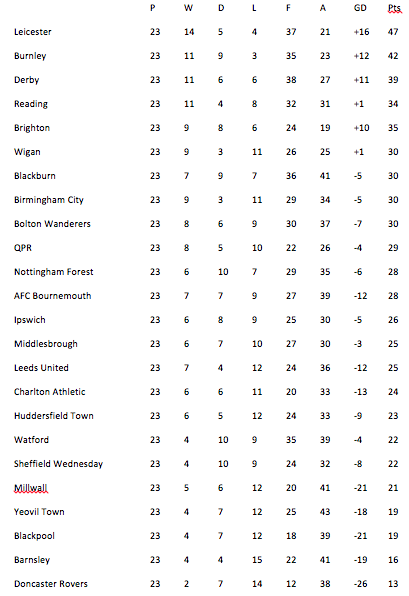 I’ve got the total as increasing left to right as before I chose a target of 76 points which in most years puts you in the play-offs and worked down towards zero from that figure. I got told off by some about integers and axes and all that blah blah so for the mathematical purists amongst you, I have mended the error of my ways! 😛 (Click on the image below). Believe it or not, around the first week of February we were no worse off points wise than the season before when we reached a comfortable mid table place with over 60 points. Things went horribly pear shaped from there and we lost 10 out of our final 13 games and in my opinion were very lucky to escape. 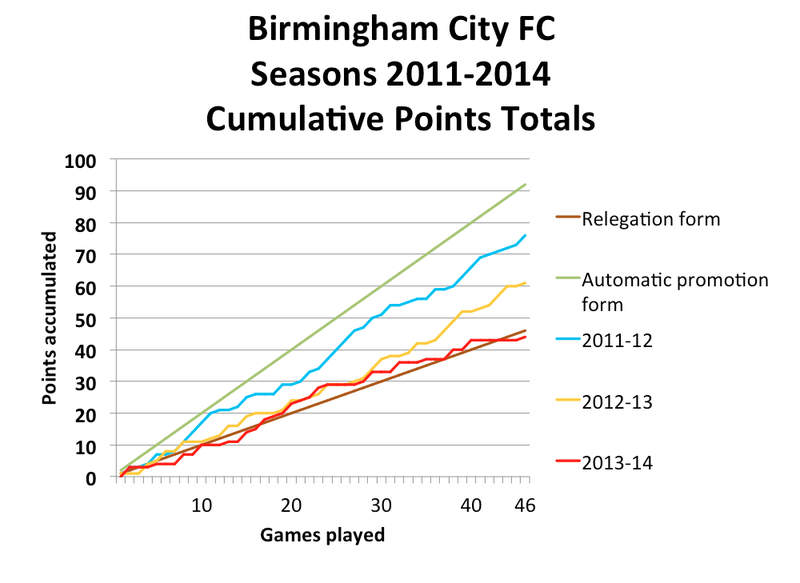 The trend in this graph tells it all; something has to change or relegation next year is assured. The rumour mill is in full spin, grinding the speculation regarding the sale of the club. It is obvious to everyone that the present owners have an untenable position and must sell but they have the problem of not being able to sell outright because it would leave Birmingham International Holdings as an empty shell which the Hong Kong Stock Exchange will not tolerate. So it must be disposed of piecemeal and this could take up to two years. However, the knight in shining armour cannot come quickly enough and there are five potential suitors if the press articles are to be believed. The club desperately needs fresh investment, that is obvious. The spine of the side needs to be completely re-equipped with the exception of goalkeeper as I feel Randolph did a pretty good job given the poor protection he received at times. The team needs two solid, experienced centre backs, a couple of central midfielders who can offer better protection to the defensive unit behind them as well as making the engine room of the side tick so experience here is required also. Assuming we can keep Burke we will still need two wide men as back up and of course we now have Novak and Matt Green returning from a serious long term injury as our strike force at the moment; so a couple of strikers needed too. A big ask which cannot in my view be conjured up using Bosmans and loanees yet again so any new owner will require a war chest since this will require money if Birmingham City are to be remotely competitive which brings us swiftly on to whether Lee Clark should be entrusted with said funds should they be available. Over the last two years, I have been largely supportive of Lee Clark because he has had an almost impossible job in dreadful circumstances. Part of me would like to say yes, give him a go since I feel he has an eye for a player e.g. 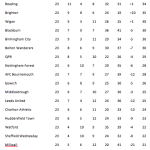 Burn, Bartley, Hughes, Macheda, Adeyemi, Novak, Lingard, Morrison who have all made significant contributions. I will accept that not all his signings have come off; Blackett, Rusnak and Howard being the most obvious examples. However, spotting players is fine as far as it goes but if you can’t pick a team from the options you have consistently and have a coherent structure and game plan any club is going to struggle and this is where I feel Lee Clark is weak. I finally lost it when I saw the team selection against Blackburn Rovers at St Andrews. I don’t pretend to be the world’s most knowledgeable tactician but that team line up was ridiculous. Five players were out of their normal positions and by the time he changed the team to something resembling what it should have been we were 3-0 down later to become 4-0 by half time. LC tinkered continually with the team line up, formation and tactics and appeared to be floundering towards the end of the season when our form and our league position were heading south. The laws of probability dictated that we were bound to pick up a point sooner or later and thank heavens that it happened on the very last day and even then we needed our east midland neighbours Leicester to do us a favour. I don’t doubt Lee Clark’s passion for the job and it is clear that he cares very deeply about the club but do I feel he is the man to take us forward? Sadly, my answer has to be no, I’m afraid, and depending on who our next owners are, they may feel the same. In summary, we need new owners willing to invest and quickly, and arguably a new manager. We need an influx of experienced players capable of competing at this level urgently; August will be upon us sooner than you think. 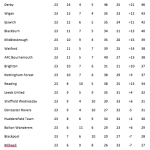 We need to steady the ship and accept that we are not likely to be anywhere near the upper reaches of the Championship any time soon. A better season than the one just passed with a mid-table finish would be a reasonable expectation. Finally Blues, let’s win a game of football at home eh? The Good: The fact that we survived albeit ignominiously. 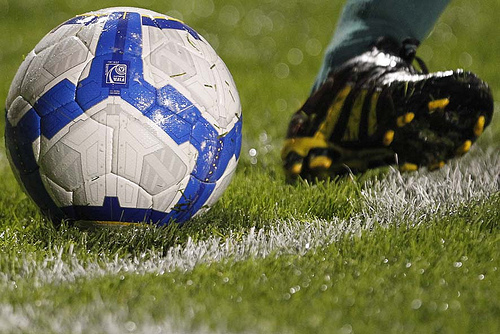 The Bad: Everything about the season both on and off the pitch. The Ugly: Our prospects if Paul Caddis had headed it over or wide! Have a great summer fellow noses. See you in August! Another super piece Bazza; I enjoyed reading it immensely and agree with most of what you say. 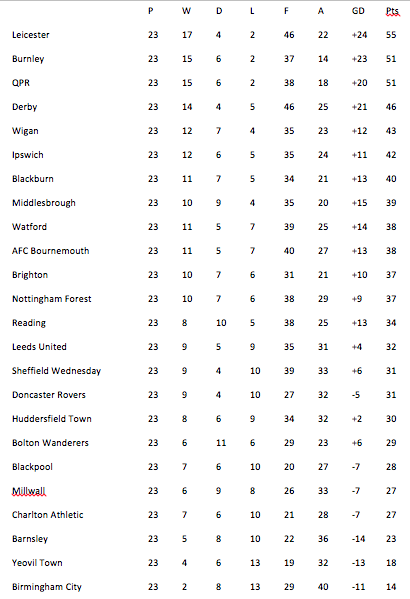 As a fan of over 50 years and a ST holder, last season was the most grim I can remember especially the home form. Thanks for your regular articles and please keep up the good work next season. I have bought two ST’s for the ladies this season (at £30 each a real bargain) and watching them has somewhat offset the disappointment of the mens season. The standard is surprisingly good and it was nice to see them beat the villa 2-0 last tuesday which in all honesty could have been 10-0. On another note I remember Central Grammar well; I currently live about two miles away from the current school in (the posh part of) Chelmsley Wood 🙂 I myself went to Bordesley Green Tech, a boys’ school which has now turned full circle and become a girls’ school. Well Baz, as one of the unfortunates who accompanies you to St Andrews and shares the driving from the South, I would like to say it has been a pleasure! But it hasn’t, the games were poor and you are the most miserable bugger when we lose. So next year I hope for a better season on the pitch, as I really don’t know if I can put up with you being miserable for 2 and a half hours on the journey home. Remember Expect the worst…. You won’t be disappointed! Once Blues have a new owner, and if reports are to be believed, it is very near, then Lee Clark should be given the opportunity to do his job without having his arms and legs tied behind his back. I too was dismayed at the tactics and team selection for the Blackburn game but at times I thought Clark did well tactically, none more so than the final game at Bolton! Lee Clark knows the club inside out now and is certainly the right man to rebuild the squad from scratch particularly knowing the strengths and weaknesses of the clubs youngsters. Obviously a new owner would have to invest in the squad and allow Clark to produce a team that he feels is capable, of at least, contesting the play-offs. Birmingham is a club that, if it is not in the Premiership, should at the very least be competing at the top end of the Championship. Will do Bazza. We’re playing Chelsea on sunday who have some ex Blues players so promises to be a bit of a grudge match 🙂 Looking forward to it and hopefully three points. Hi Bazza, not sure whether you remember me, nor me you. I was 15 in 1972 and also attended Central Grammar School and dreaded those trips to Wales. I remember ’72 well as George Tustin (Maths Teacher and Villa Fan) took 4 of us to Leyton Orient on a Tuesday night in May to watch Blues win promotion to the First Division. We won 1-0. The ground was full of Bluenoses and Millwall fans (if we had lost, they would have been promoted). Bob Latchford scored and then Millwall fans did everything they could to get the game abandoned – pitch invasions, bomb hoaxes. Got home at 3 in the morning and dad made me go to school the following morning (bike from Sheldon down Mackadown Lane). Previous year went on school trip to Heathrow. Bored s***less watching aeroplanes so George Tustin and Bob Peck? (Art Teacher) took a few of us into London for a tour of seedy Soho and my first proper curry! Memories. Andy, if we get new owners Clark will be gone. History. End of.